← Dr. Srdjan Acimovic, candidate for the Plant Pathologist position at the HVRL, presenting on January 26th at 2:00 PM. Dr. Srdjan Acimovic, candidate for the Senior Extension Associate / Plant Pathologist position at the Hudson Valley Research Laboratory met with growers and search committee members on January 26th at 2:00 PM. 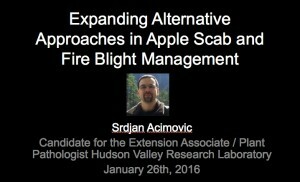 His presentation was entitled “Expanding Alternative Approaches in Apple Scab and Fire Blight Management”, available in the link above. The presentation will also made live via Polycom conferencing to Cornell University locations in Geneva, Ithaca and Riverhead, NY.